With a balcony accessible by the living room and master bedroom, guests staying in Shorewood 438 enjoy a great view of the Atlantic Ocean and the Shorewood pool area. Shorewood 438 has a remodeled kitchen fully stocked with granite counters, new cabinets, new flooring, new appliances, new bedding, and both bathrooms have been remodeled. New Flat Screen TVs with HD & Smart TV(3) have also been added including a 50" 4K smart TV in the living room. The living room seating and extra sleeping area includes a memory foam mattress on the sleeper sofa. King in the master, 1 queen & 1 twin in the 2nd plus a queen size sleeper sofa in the living room. After hours in the surf, vacationers return from the ocean via Shorewood's beach walkway and then dip into the freshwater swimming pool or a seasonally heated spa. Pool is Heated March 1 - April 30 and Oct 1 - November 30. Toddlers have a separate wading pool. Shorewood is a five story elevator building located in South Forest Beach. Among the amenities offered throughout Hilton Head Island, Shorewood is two blocks from the Coligny Beach Market, a quaint downtown area that offers a wide selection of restaurants, shopping venues, and entertainment for all ages. Condo was exactly as described! Kitchen well stocked with equipment. Condo was clean and newly remodeled! Nice view." The condo was clean and very comfortable. We enjoyed the spa and the walks on the beach. We will definitely come back." Had a wonderful stay @ 438 Shorewood. The property was in excellent condition, with the little things considered (extra beach chairs, a crock pot, new appliances, and nicely updated bathrooms). When we did request a service for a minor issue, the property rental company was pleasant and the helpful and kind repairman fixed the issue without delay. 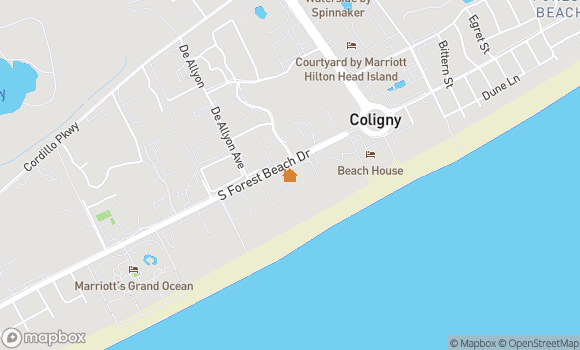 The property location, with its proximity as an oceanfront condo complex, was an under 5 minute walk (with kids) to Coligny Plaza with shops, ice cream, and a playground. We have stayed in Shorewood previously, love the complex, and appreciated the excellent treatment from Seashore Vacations. We will certainly consider renting through them in the future!" The unit is clean, well furnished. Washer and dryer work well. Kitchen well stocked. Had everything we needed for our family of six. Nice view. Even had a few beach chairs and sand toys we could use. Would stay here again." I recently staying in this condo with my 14 year old daughter and two of her friends. It was clean and comfortable and provided everything we needed. Pool and easy access to the beach was awesome plus the girls could easily walk to the shops and restaurants at Coligny without supervision because it was five minutes away. Grocery store is also a five minute walk. So nice to not have to drive everywhere. Mostly families staying there with no security issues or questionable activity anywhere around. We enjoyed it. I had a minor maintenance issue while there which was handled immediately. The keyless door makes it great - no remembering or carrying keys with you. We will return." 438 Shorewood is in great location, great view, beautiful and well equipped condo. Walk to beach and Coligny Plaza. Bike on trails. Perfect location. " 438 in Shorewood is a great condo to stay in. They have made nice improvements & updates to condo. Only Suggestion is you have to get the Golf Channel." We decided to add a fun beach weekend to the end of our summer since our week in June on the north side of HHI was pretty gray and rainy. We found Shorewood 438 on VRBO and booked. We absolutely loved the place and it worked out perfect for us. We had two adults, our sons, 20 and 13, our daughter, 19 and a male friend of the kids. All 3 boys stayed in the second bedroom and everyone was comfortable there. Our daughter slept on the sofa bed. The sofa bed was your typical thin mattress but it was clean and comfortable enough for a couple of days at the beach. The Master bedroom was wonderful. Very comfortable and beautiful views of the pool and the ocean and separated enough to be private (just keep the blinds to the patio closed or you can see right into the main family room - and they can see you!). The condo was as described and as pictured and had most everything we needed (good, sharp knives seem to be a rarity in every condo we've ever stayed in though). The owners had a couple of boogie boards and 3 simple beach chairs to use which came in handy for us (thank you!). The property was excellent and well kept. We didn't use the pool (stayed at the beach the entire time) but it looked nice and many folks were there. The short walk to the beach carrying our stuff was fine and the beach was fantastic. Shorewood is located between the crowded sections of beach at Coligny Plaza and a resort to the south, but our beach was comfortable and not overly populated during the days. We walked to Coligny and ate there a couple of nights. One final note - if you like seafood, go to The Seeafood Shack!! You can dine in if you like, but we got it to go and brought it back to the condo. Either way, you wait in the same long line, but it does move fast. Their food is amazing! Loved the scallops." Relaxing, accessible, clean, spacious and convenient to beach and Coligny." The condo was beautifully updated with new flooring, bathrooms, and furniture. Great view from the balcony. The Shorewood condo complex is well kept with clean and modern facilities. " Please let the owners know the renovations to unit 438 are awesome. The floors are beautiful and the bathrooms look great. The keypad was a very nice addition. I love renting in the Shorewood complex because of it's location and quality of units. I wish Seashore Vacations did not require guests to go to the office on check-In day when there is a keypad on the unit. Other friends who used other agencies were sent their codes prior to arrival and were told they could access the unit after 4:00 pm. Leaving the beach to go to the office is extremely inconvenient. This alone might change my choice of agencies in the future. " "Perfect stay for a family with young kids! This property is exactly as described and a perfect location on the beach. We have 3 kids under the age of 7 and they loved their visit. The pool is large and well maintained. The grounds are manicured beautifully and the beach is only steps away down the boardwalk attached to he property. This unit also has an A/C unit that works well and strong water pressure. Those can make or break a visit for me! Check-in and check-out was easy and the staff was great to work with. " "Beautiful location, but somehow check cleanliness of condo! The condo was very dirty. The carpet was filthy! We had to keep socks on to walk around. The bathroom tubs & drawers were very dirty. The kitchen stove top & drawers were dirty. Closet doors & blinds were broken. There was a water leak in the ceiling which we contacted the management company, they looked at it & said someone would come and fix it, but that never happened the week we were there. This condo needs updating in the bathrooms & bedrooms. Very disappointed for the price we paid! I would recommend this location, but not #438"
Great condo in a great complex. This is the 6-7th time we have stayed at Shorewood. It is the prefect place to stay for a pool/beach experience. Also it is within easy walking or biking distance of restaurants and shops. " Awesome location, very nice condo on the 4th floor. This is the 2nd year we have stayed here and plan on returning. It is close to the ocean, a very nice pool area. Shorewood 438 is well kept and beautiful view of the ocean. The entire conplex is well kept. Absolutely enjoyed ourselves." Quick and easy check in after a long drive. Unit ready when we got there. Great views from balcony and perfect weather." The Living Rm. Couch & Matching Chair were almost unuseable & need to be replaced. The Bathrooms were not clean & we needed to clean them before using. The renovations was on 7 days a was too much noice until dark and very dirty. the sofa is a back killer.I did asked for some compensation but I am still waiting for ananswer.Your company is a good one comparing to my friends 's one"
We have stayed in this condo for three years now and have recommended Shorewood to a number of family members and friends. We enjoy Shorewood very much but found our condo #438 in a run down condition this time. The living room furniture was saggy, dirty and not comfortable. It's just worn out. The bathroom needs holes fixed, new paint and the whole condo needs a real good cleaning or replacement of the carpet. Any time a condo can offer relaxing,simple comfort - that's what we look for and want. We probably won't stay in #438 again. That'sDisappointing." We were pleasantly surprised with the calmness and quietness of the surroundings. Loved it. " We liked the location & pool. The condo was a little dirty. It appeared it was cleaned in a hurry. The kitchen was very nice & updated but the bathrooms looked worn & need of some repairs. Carpet looked stained & a bit dirty. Other than that, no other complaints." We loved the location - central walking and biking distance to shopping and restaurants. The ocean view, pool, beautiful landscaping, and service made it feel more like a resort! " The whole experience was amazing....great service, great location, great accommodations. We will be back!!" Condo very musty. DVD button on TV didn't work. Air didn't do the job. " Had a great time even though we had 2 days of bad weather." Look forward to next year already!!!" will definitely would go back and stay if given a chance."